I'm not sure what to say about cherries. If you're not eating them, you're missing some of the best fruit nature gives us. I eat cherries by the pound as soon as they show up in summer, until they're practically past their prime and rotting in the box on the way home at the end of the season. I've never thought to do anything with them other than snack on them. Although I love cherry pie, cherry strudel, even cherry soup (yes, there is cherry soup) cherries in my kitchen do not last long. This time I wanted to try something new, and last week wanted something festive for the 4th of July. Somehow I suddenly wanted to try making a cherry baklava, even if it's not as quintessentially American as I had in mind, I told myself it could be a great melting pot tribute to the U.S.A. After all, I'd like to think ingenuity is a quality all patriotic people embrace. I should say that I realize that my use of the word "baklava" is only loosely appropriate here. I have never been to any of the countries where baklava is a mainstay (Greece, Turkey, parts of the Middle East) so maybe things are different there, but in New York City, I have never seen a variation on the classic baklava. So, I hope I don't offend any die-hard baklava fans with this adaptation. That said, I feel that the use of layers of phyllo dough, chopped nuts and honey syrup are enough to allow me to consider this dessert a baklava of sorts. It is filled with pitted and chopped cherries and a bit of sugar (they're so sweet they hardly need much help). It adds a nice flavor to the dish, as so many baklavas are completely overpowered by the honey syrup poured over the top. If you want a stellar recipe for the classic kind, check out this amazing version. As this was my first baklava attempt, I decreased the amount of layers of phyllo between each layer thinking it wouldn't matter and be less about the crust. That was a mistake. As you can see in the photos, it's a bit too flat. I have adjusted the recipe so that when you try it it will be better thickness. Before you worry that you can't make this dessert because you don't have a cherry pitter, neither do I. Since I was chopping the cherries in half, I simply used a small pairing knife and my fingers. It took about ten minutes to pit about a pound of cherries working quickly. Not the end of the world. Alternatively, here's a great rundown on all the different ways to pit a cherry, including using a safety pin. Like I said, perfectly whole cherries are not needed for this recipe though, because phyllo is too delicate to be able to layer around them without a mess. Everything is chopped which adds to the great texture that this dessert has. 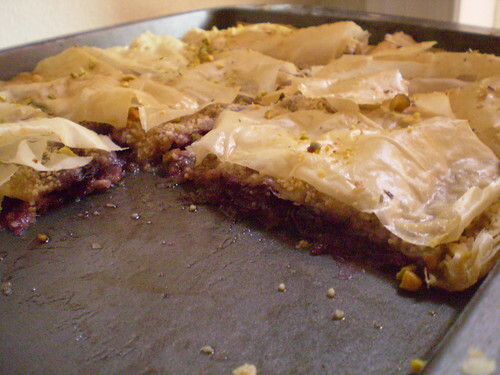 Its a mix of crunchy chopped pistachio nuts, the soft syrup soaked bottom layer of the phyllo, and the light as air crisp top layer. It's all those things with an added layer of cherry pie filling mixed with ground almonds. Another American virtue, like it or not is excess, and this is definitely an excess of dessert goodness. 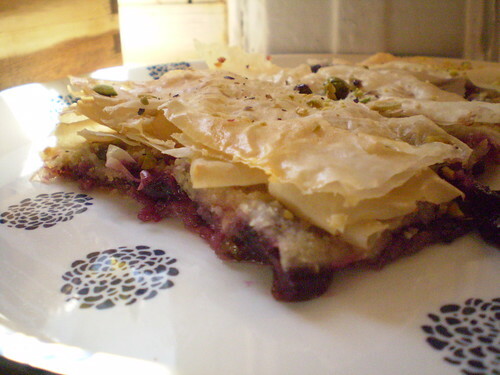 Bing Cherry Baklava Adapted from The Olive and the Caper, by Susanna Hoffman. Makes one 9"x13" pan. Can be prepared ahead of time and left out till serving. Preheat the oven to 350 degrees Fahrenheit. Prep ingredients before layering. Take phyllo dough and lay flat with a sheet of wax paper on top with a damp kitchen towel over that to keep sheets moist. Melt butter. Pit and chop cherries, mix with sugar and cornstarch, and set aside. Mix ground almonds and vanilla. Set aside. Chop pistachios and start to layer the baklava. (Either cut phyllo to fit pan before assembling or you can cheat and do it at the end like me). Start with 7-8 layers of phyllo at the bottom of a 13"x9" inch pan. Brush melted butter over each layer before laying on the next. Butter the last layer, then spread a third of the almond mix evenly over the pan. Follow that with chopped pistachios. Take cherries and spread them evenly over the almond layer. It will look messy, but don't worry. Place another 8 layers over that, continuing with butter in between each layer. Layer another third of almond mixture and then pistachios. Repeat layers once more, and end with the last 8 phyllo sheets. Brush with butter well. Using a sharp knife, cut through all the layers hanging over the pan, if you still need to and then cut 15-18 diamond or square shapes. Place in the oven for 20 minutes. After 20 minutes, take out of the oven and pour any remaining butter over the top and continue to bake for another 20-25 minues until golden and crisp. Remove from the oven and let stand for 5 minutes to cool slightly. To finish, take the honey syrup and pour around the edges of the dish and in between the cuts. Avoid spilling on top to prevent it from being soggy. Set aside and let cool completely. Sprinkle top with chopped pistachios. Feeds many hungry people or a few greedy ones.